Many of you know that I work a full-time job as well as run Peyton’s Momma. So that means I’m working some long hours! Frequently, I am up working until the wee hours of the morning or I’m getting up dawn to get some writing done. Which means, often I am working in the dark. I had a little desk lamp that I thought was doing well. It seemed to give me a fair amount of light but I was constantly repositioning it depending on what I was doing so I could see. I thought I had the best solution to my office lighting issue until I saw the BenQ LED desk lamp. The BenQ LED desk lamp is 5 times the light space as my other lamp. I can light up my whole work space! When I’m working at night I just turn on my BenQ lamp and instantly my whole keyboard and monitor are illuminated. I never realized how much I was straining my eyes until I started using the BenQ lamp. The height of the lamp is adjustable as well as the light. I can angle the light or adjust the height to fit whatever project I am working on. I can also use this at our kitchen table if I am working on a craft project. But the most impressive feature to me is the light area coverage. I have never had a lamp that has covered the entire desk without shadows. Before I started using the BenQ lamp in my home office I never knew just how strained my eyes where. Yes, my eyes were tired at the end of each day but I just assumed that was from long days of working hard. But really, it was from long days of working in poor lighting. I no longer have those sore tired eyes. Now I’m just tired from working all day in a well lite environment. 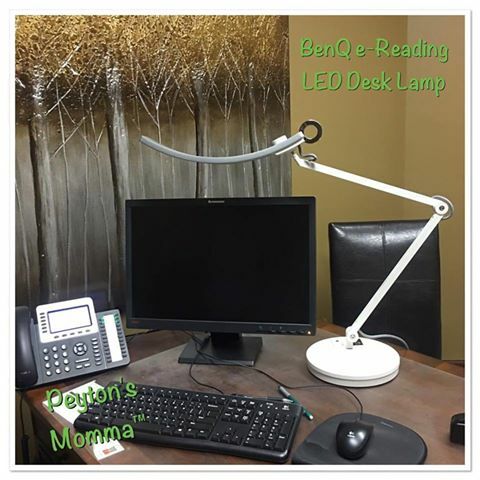 If you spend a lot of time working on a computer or reading or doing projects with fine detail you should look into the BenQ LED desk lamp. It’s worth the investment.